As a leader in the ICT4D space, Gram Vaani understands what it takes to really have impact with technology on the ground. With various deployments, we have been able to perfect our model harnessing online and offline community interactions for development outcomes by juxtaposing data collected from different stakeholders — communities, development agencies, government departments — helping them notice gaps in services delivery to improve efficiencies. Built on simple phones, our fullcircle for development platform allows new ways for different stakeholders to interact with each other, and have their voices define field outcomes. 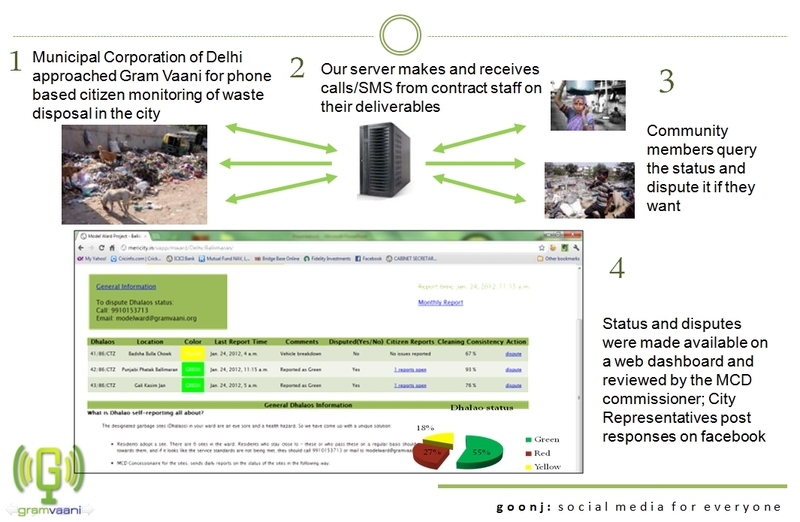 See how the Municipal Corporation of Delhi used Fullcircle to improve garbage collection in 18 wards of Delhi. According to our friend, Anita Bhargava, who was closely involved in the project, “We found that, when reports are in an auditable medium, the tendency to lie is very low. With the help of this system MCD could do root cause analysis of the issues on hand and make systemic changes, rather than in a fire fighting way“. The system thus helped MCD understand what was and was not working within the organization, and fix it. What is possible with fullcircle for development? fullcircle for development is ideal to improve accountability and transparency in the delivery of public services, including health, education, microlending and citizen governance. Our team of technical experts and operations managers work closely with every project to understand objectives, and tailor-make solutions to fulfill project needs. There is much more that is possible with fullcircle for development. Mail us at contact [at]gramvaani.org/ and tell us a little more about your intervention, and we will share ways to involve community voices with the process.